Motorola, leader in television, shows how TV can mean better behavior at home and better marks in school! Own a Motorola and you know you own the best. Does that clown look terrifying to anyone else? 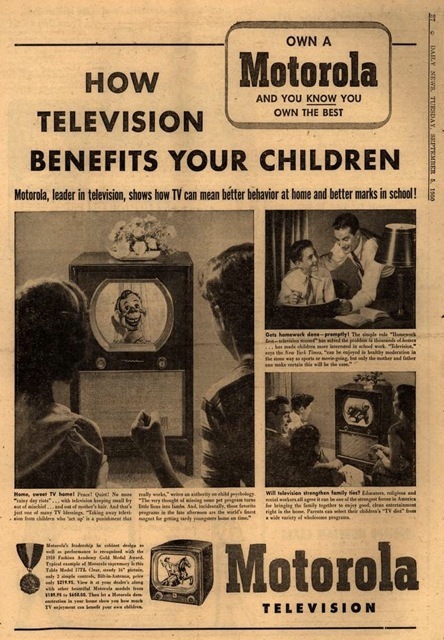 This entry was posted in Commentary, Photos, Television, Vintage and tagged Ad, children, Motorola, scary clown, school, television, vintage. Bookmark the permalink. No dummy..Howdy Doody was a Marionette or “string puppet” – These puppets are suspended and controlled by a number of strings, plus sometimes a central rod attached to a control bar held from above by the puppeteer. The control bar can be either a horizontal or vertical one. Basic strings for operation are usually attached to the head, back, hands (to control the arms) and just above the knee (to control the legs). This form of puppetry is complex and sophisticated to operate, requiring greater manipulative control than a finger, glove or rod puppet. The puppet play performed by the Von Trapp children with Maria in The Sound of Music is a marionette show. It’s a ventriloquist’s dummy. Thankfully, for the sake of our children’s and many adults’ mental health, it’s no longer a popular act. That’s no clown, it’s Howdy Doody Time!!! Howdy Doody is an American children’s television program (with circus and Western frontier themes) that was created and produced by E. Roger Muir and telecast on NBC in the United States from 1947 until 1960. It was a pioneer in children’s television programming and set the pattern for many similar shows. One of the first television series produced at NBC in Rockefeller Center, in Studio 3A, it was also a pioneer in early color production as NBC (at the time owned by TV maker RCA) used the show in part to sell color television sets in the 1950s. I had no idea! Thanks for the info.